Christopher Latham Sholes was a newspaperman, politician and inventor. He learned the printer's trade in Danville, Pennsylvania. In 1837, he moved to Wisconsin and settled in Green Bay. He joined his brothers, Henry and Charles Clark Sholes, in the publication of the Green Bay Wisconsin Democrat. 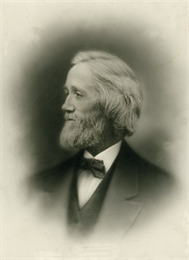 In 1839, he became manager of the Madison Wisconsin Enquirer. In 1840, he established the Southport — now Kenosha — Telegraph. He published the periodical with various partners and brief interruptions for 17 years. He worked briefly with various Milwaukee newspapers afterwards, such as the Wisconsin Free Democrat, the News and the Sentinel. Sholes was originally a Jacksonian Democrat, but eventually helped to organize the Free Soil and Republican parties in Wisconsin. He supported Lincoln, Johnson, the Liberal Republicans and eventually joined the Greenback party. He was state senator from 1848 to 1849 and again from 1856 to 1857 and state assemblyman from 1852 to 1853. During the Civil War, Sholes also served briefly as Milwaukee postmaster, and was later port collector and commissioner of public works. Sholes was an active inventor and developed several devices during his newspaper career, including a paging or numbering device in 1864 and a newspaper addressing machine. In 1867, he produced a crude writing machine, gained financial backing and developed a model by 1872 that became the prototype of all modern standard typewriters. Sholes continued to work at typewriter inventions for the rest of his life. He eventually sold his interest in the original machine piecemeal from 1872 to 1880. He spent his later years in retirement in Milwaukee. See more images, essays, newspapers and records about Christopher Latham Sholes. Dict. Amer. Biog. ; R. N. Current, Typewriter (Urbana, 1954); Wis. Mag. Hist., 32; Milwaukee Sentinel, Feb. 18, 1890; WPA MS.